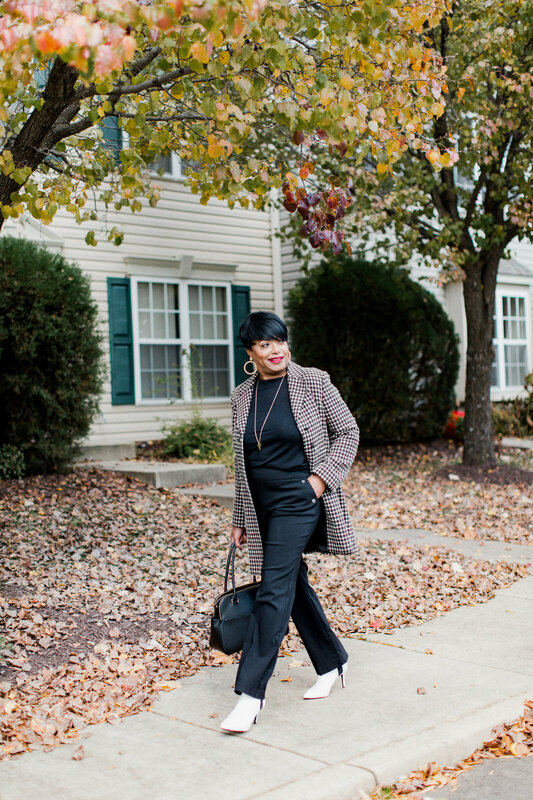 Hi Lovelies….Happy Wednesday…we made it to the middle of the work week and I’m excited to share with you one of my new favorite pair of pants for the 9-5 job..they are the “Classic Fit Super Stretch Pull-On Button Pants” from Dress Barn. Guys, let me tell you, these pants are super cute and I love that they’re “pull-on”….did you hear me, “pull-on”…no unzipping or unbuttoning….and they are very comfortable and I love the button detail on the pockets. I received so many compliments on these pants when I wore them to work and I paired them with a black sweater and white booties and checkered coat for a super chic look! The pants are in size 2 -16 and they also come in navy…and you can totally dress them up or down, depending on the occasion. I personally like wearing a heel with this style but you could totally not do the heel…either way, they are just super cute and very flattering. Guys, I totally shopped by closet for this look…the pants of course are new and the white booties are kind of new…but the black sweater is from last year and the coat, OMG…I’ve had this coat for almost 15 years…and the handbag, it’s my girlfriends…she was over at my house when I did this shoot so I borrowed it for the pic! Now head over to Dress Barn and order a pair of the “Classic Fit Super Stretch Pull-On Button Pants” ….trust me, you’ll love them!